Small Channel Spotlight, General Sock, 2/6/2015 - KABALYERO - PLAY, BLOG & EARN! Small Channel Spotlight is where I'll feature a small youtube channel like The Kabalyero Show so you guys can check it out and possibly give it some love. In this post, my Small Channel Spotlight is on General Sock. With less than 100 subscribers, General Sock is definitely a Small YouTube Channel. Now, as a YouTube Channel, General Sock has a lot of Minecraft and Skyrim videos. I saw a couple of his Minecraft videos and they are quite good. So, if you enjoy watching Minecraft videos then check out General Sock. You can check out General Sock in YouTube at https://www.youtube.com/user/RealGeneralSock/. As a small youtube channel, General Sock is currently partnered with Freedom. 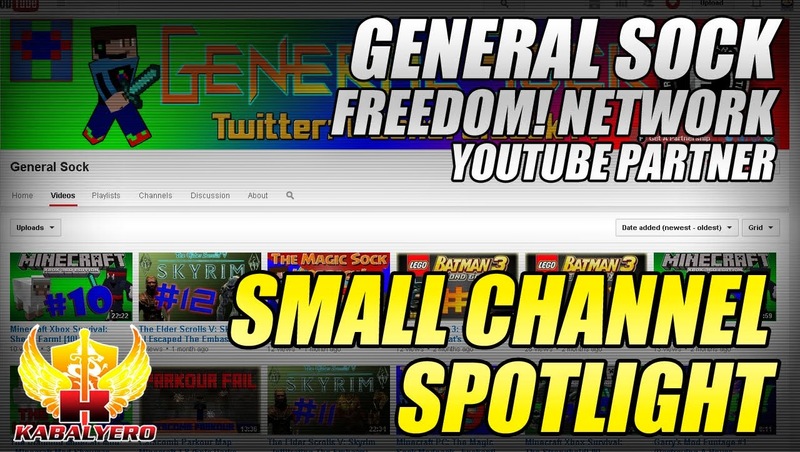 If you have a small youtube channel like General Sock that you want partnered with a YouTube Network then I suggest that you partner with Freedom!. Interested in becoming a YouTube Partner under Freedom? If you are then apply here.